A thin wire, chemically sharpened needle point Octopus bait hook known for its durability and strength. L2 is the longer shank version of the L1 Needle Point hook. 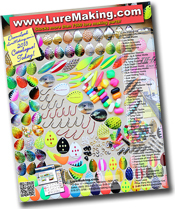 Excellent on walleye harnesses, drop shotting, single egg (yarn flies) and other lures. Offset! *Size 1/0 and 2/0 are drop shot favorites! The L2 Octopus hooks are a re-engineered design for increased sharpness and curability. Superior Penetration, Increased Hook Up Ratio. Perfect combination of sharpness, strength and design. These hooks are super strong, super sharp and simply the best value in premium needle point fish hooks! Made in USA!